It’s the holy grail for travelers in Latin America — a bona fide hacienda with sweeping views of the Andes, traditional homemade cuisine, access to the day-to-day happenings of a working ranch all around. In short, a getaway that offers real access into the local culture, rather than costumed folklore shows and pan-pipe music in surround-sound. Zuleta hits all the marks, plus a few more, which explains why the ranch is no longer a little-known refuge but a famed destination, lauded in most of the big-name print publications. Located in the Andean foothills about a two-hour drive north of Quito, Hacienda Zuleta is a 4,000-acre working ranch that dates from the 16th century; for the past 100 years, it’s been under the ownership of the family of one of Ecuador’s mid-century presidents. The hacienda itself has fourteen guest rooms, all impeccable, with fresh flowers, colorful paintings and locally produced basketry, wooden writing desks and quaint fireplaces — but the sleeping arrangements are not what’s important here. One comes here to Zuleta to hike and horseback ride, feast on abundant, farm-fresh cuisine and space out (or watch birds, if that’s your persuasion) in front of some stunning mountain vistas. There’s an on-site creamery and cheese factory where you can sample the region’s famous semi-hard cheese, a rehabilitation center for the local condors, a fair-trade embroidery workshop where you can watch local artisans at work and purchase their products, even an archeological site dating from the year 700, representative of the Caranqui indigenous group. And in the evening, having had your fill of fresh air, you’ll retire to the hacienda’s rustic wood tables for freshly caught rainbow trout — prepared according to the longtime family recipe — then rest easy with the knowledge that you’re sleeping inside the real Ecuador. 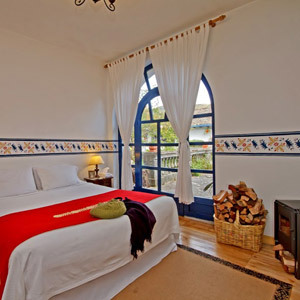 How to get there: Hacienda Zuleta is located about 2 hours northeast of Quito’s Mariscal Sucre Airport (UIO). Please email CustomerService@TabletHotels.com for further information or assistance with transportation.